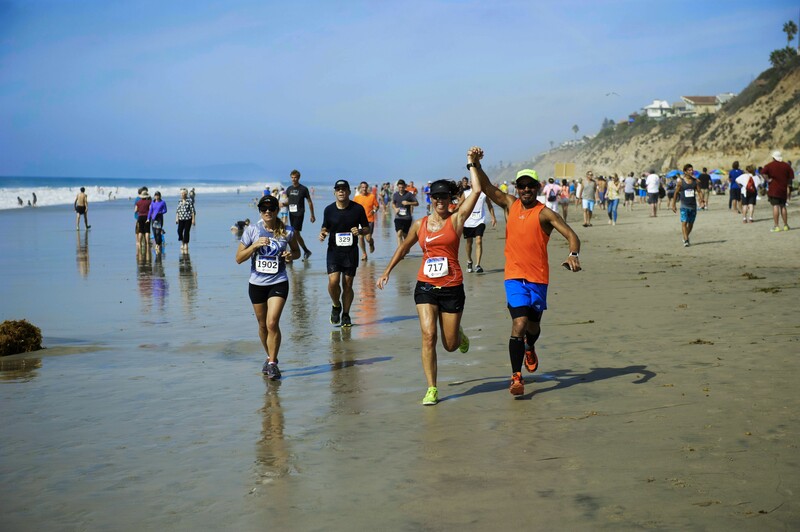 The surfing madonna beach run is located in the heart of encinitas, on the beautiful sands of world famous moonlight beach.the course curves along the waters’ edge along the most scenic beaches in north county san diego. For 2018 the 15K is being changed to 12K. Our Cause: The Surfing Madonna Beach Run is about more than just fun, fitness and community, it’s an opportunity for you to help keep our oceans clean, our coastline protected, and to provide opportunities for disabled kids and adults to experience the healing power of the ocean. 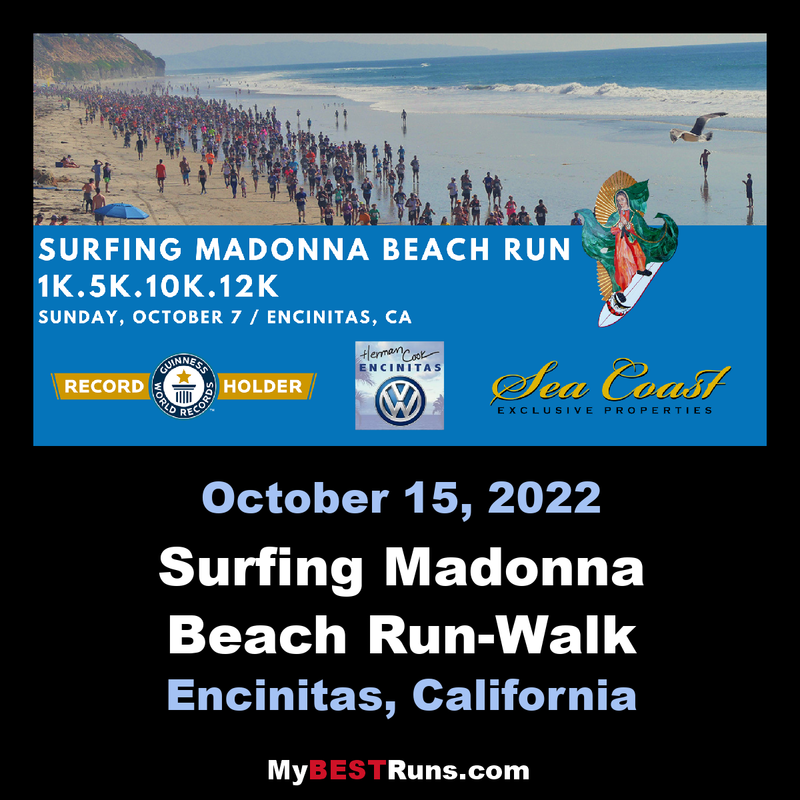 100% of the proceeds from this run go directly to the Surfing Madonna Oceans Project, a nonprofit organization dedicated to protecting our ocean from the harmful effects of pollution, and to cultivating new ocean advocates. Run (or walk) knowing that your participation is making a positive impact on the world! Running on sand makes you work harder. With each stride, your feet sink a little, forcing you to exert more energy than running on tarmac, and burning around 30 per cent more calories. Running on sand without trainers forces your smaller, stabilizing muscles in the knees, ankles and feet to work harder than running on roads. Therefore, continual beach running and strengthening of such muscles may help to prevent common road injuries. Onlookers must think beach runners are crazy as they watch them fly up and down Moonlight Beach in Encinitas. It’s great resistance training and strengthens the legs. To put your agility to the test, jump over small piles of driftwood or pools of water, and race the incoming tide for short spurts of speed work. A study by Griffith University, in Queensland, Australia, found that landing on soft sand increases the time in which our feet sink into it. The overall stress of pounding on the lower joints, such as ankles and knees, is reduced. Sand running also allows you to give your calf muscles a good workout without the risk of any impact injuries, and can also reduce the risk of shin splints. Nothing beats diving into the ocean after a hard beach run. A soak in the sea won’t give you the same recovery benefits as an ice bath, but it will work wonders to soothe your hard-worked muscles while leaving you feeling refreshed. Encinitas beaches are hands down the most beautiful beaches in San Diego. Unlike other beaches that are lined with boardwalks full of bars and tourist shops, Encinitas beaches have a more remote, pristine feel with huge cliffs, tons of marine life and world class surfers. You can watch playful dolphins, spouting whales, and curious sea lions. They call Encinitas the “gem” of San Diego. Come see for yourself! If you feel moved to fling off your running shoes and run directly on the sand, GO FOR IT! It also forces you to grip with your toes, which strengthens both calf and feet muscles.